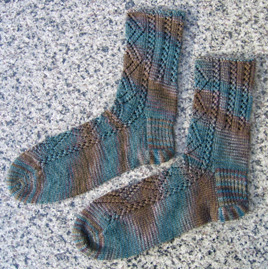 I mailed the socks to my grandma this morning, so Wednesday or Thursday I’ll hear from her to see if she likes them :). Time for a little venting. Adrienne Vittadini sweater. Sizing. Grumble. I took out a few of my favorite sweaters and measured their bust at underarm and length to shoulder. They are all a little different, but I think for my (soon to be) AV sweater, I want the bust to be 36.5-37″, and length to shoulder to be 22-22.5″. Now it becomes complicated. 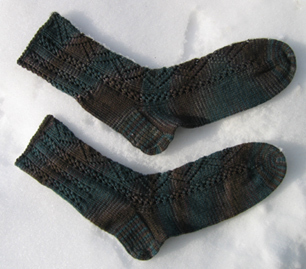 The AV sweater pattern is written for 35, 39, 43, 47, 51″ bust measurement. So already I’m going to have to adjust the width of the sweater. But this is not the biggest problem considering this: the sweater pattern is written for 23, 23.5, 24, 24.5, 25″ length-to-shoulder measurements. Who are these people with such long torsos? (This isn’t true of all AV patterns; others in the book are closer to my desired sweater length) Because the body of the sweater is shaped, it’s not just a matter of making it shorter. I’m going to have to take some measurements and probably compare this sweater pattern to others in the book, and then make some serious adjustments. Grumble. 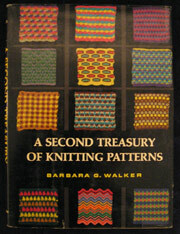 I rented two “Knitting Workshop with Elizabeth Zimmermann” videos from the library, and really enjoyed watching them. She is such a cool cucumber, she doesn’t make anything seem complicated. Cutting your knitting or making fancy seamless shoulder shaping is as complicated as casting on a stitch! I picked up a few interesting tidbits – she doesn’t make a slipnot when she starts casting on, just like me! She purls using the Norwegian purl, and she knits very loosely. Fascinating. The videos were pleasantly homemade – she talks to Meg Swansen off-camera, drops needles and tangles her wool all the time. One of my favorite parts is when she is talking about putting pockets into sweaters as an afterthought, and just on a whim cuts the vest she’s wearing to show how she would unravel the wool and put a pocket in there! She has a bit of “heretic” in her, and says “they said I wouldn’t be able to put shoulder shaping into a seamless sweater, so I showed them” and “for whatever reason they wanted a seam down the side of a sweater, so I made a phony one.” I like how she doesn’t talk down to the person on the other side of the television, nor makes the lessons too cutesy and non-serious. Isn’t it pretty? I see only one modification I’d like to do: I want the lace to start approximately at armpit level. 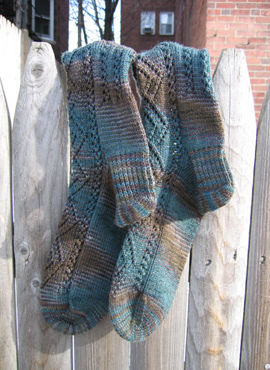 The yarn used for the pattern is, of course, Adrienne Vittadini brand, called Martina. 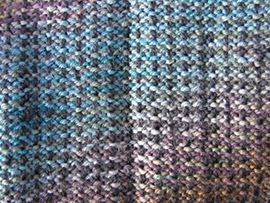 Martina is 70% merino wool and 30% silk, 11 wpi, 19 sts/4 inch on US7. One ball has 50 grams, 109 yards, and costs more than my rent… I mean, $15. I need 11 balls to complete the project (11 x $15 = $165). Ha! Not a grad student’s stipend. I am soliciting suggestions for an alternate. I already have two in mind, but I won’t bias you. I would like the replacement yarn to be the same gauge, and either 100% wool or a wool blend (alpaca, cotton, silk, synthetic is fine; mohair and angora are no good). 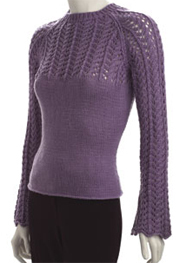 Lavender doesn’t look good on a pale person like me, so I was thinking of making the sweater crimson/garnet/cranberry. Oh, and less than $80 would be great :). I eagerly await your suggestions :).